Barrel bombs are an atrociously indiscriminate weapon, for sure, and their use rightly comes under the category of atrocity. However just as the atrocity of the allied firebombing of Dresden in 1945 did not invalidate the war against European fascism then, neither does the atrocity of Syrian barrel bombs invalidate the war against its Middle East equivalent today. This is what Malcolm X referred to once as turning the victim into the criminal. When Assad worked out an agreement brokered by Vladimir Putin to get rid of his chemical weapons (at least those that could not be hidden away for future use), the antiwar movement—such as it was—patted itself on the shoulder for pressuring the USA and Britain from launching a Bush-style invasion of Syria as if this was ever in the cards. Assad’s move was pretty smart seen in retrospect. It gave him a blank check starting in October 2013 to step up his aerial bombing campaign including the use of barrel bombs. UN Security Council Resolution 2139 of February 22, 2014, ordered all parties to the conflict in Syria to end the discriminate use of barrel bombs and other weapons in populated areas. In spite of that, both the Syrian and the Iraqi governments continue using them against civilians. Human rights groups have characterized them as weapons of terror and illegal under international conventions. It is of interest that Chelala has included Iraqi barrel bombing in the equation. I confess to not having kept up with this part of the depravity of the al-Maliki regime, whose membership in the “axis of resistance” apparently required savage attacks on the Sunni population that made it possible for ISIS to get a foothold. My own position is pretty radical. I am opposed to aerial bombardment period. 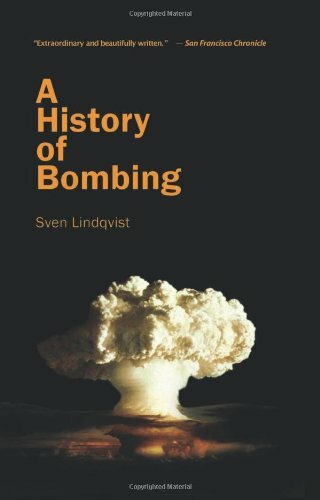 Reading Sven Lindqvist “A History of Bombing” that was published in 2000 shaped my thinking on this matter. I was familiar with Lindqvist through an earlier book titled “Exterminate All the Brutes” that was about how Hitler’s genocidal policies were first carried out in Africa. Lindqvist’s book makes the case against bombing from the air through an examination of the ideology that justified it as well as the murderous effects when either the bad guys or “the good guys” carried it out in places like Dresden or Hiroshima. In the excerpt below, he shows how abhorrent the idea of aerial bombing was to the military, so much so that an Italian military man who advocated it was court martialed. We have come a long way when the “anti-imperialist” left cheers on Russian bombing (as well as French and American) in a fashion that reminds me of George Jessel appearances on American television in the 1960s when he would show up in an Uncle Sam suit to “support the troops”. The first person to step forward and openly acknowledge what the others were hiding was the Italian Giulio Douhet. He arrived as a young cadet in Torino, the capital of the Italian auto industry, and wrote his first book on the military use of motor vehicles (1902). In 1910 he published a book on the problems of the air force, and in 1912 he was appointed chief of the newly formed air squadron in Torino. The next year he and Gianni Caproni constructed the first heavy bomber, a tri-engine monster created to make bombardment from the air the dominant form of attack. When the World War broke out, Douhet became famous for his criticism of the way the war was conducted and his impassioned pleading for the use of the heavy bomber. The generals were enraged, and Douhet was relieved of his post and court-martialed. But he was justified when the defeat of Italy in 1917 proved that his criticisms had been correct. Several years later the Ministry of War published Douhet’s most important work, ll dominio dell’aria (Dominion of the Skies, 1921). It came out in German in 1935 and in English in 1942, but long before then it had exercised decisive influence on military thought, not least in Great Britain. Douhet’s principal argument is that war is transformed by the technical means at its disposal. Barbed wire and rapid-fire arms transformed warfare on land, the submarine transformed war at sea. The air force and poisonous gas will lead to changes just as great. The war of the future will be total war. In the old days, civilian life could go on relatively undisturbed behind the front. International even created a legal distinction between “combatants” and “noncombatants.” We have passed this stage, Douhet argues, since air warfare makes it possible to attack the enemy lehind the fortified lines. It erases the distinction between soldiers and civilians. Air raids can never hope to achieve the same precision as artillery fire. But neither is that necessary—targets for bombs should always be large. In order to succeed, air raids must be carried out against very large centers of civilian population. Is this forbidden? All international agreements reached during peacetime will be swept away like withered leaves during war. So let’s forget false hopes. When you’re fighting for your life—and today that’s the only way to fight—you have the sacred right to use any able means to avoid going under. To destroy your own people for the sake of a few graphs of legalese would be madness. Air warfare offers for the first time the chance to the enemy where he’s weakest; poisonous gas can make that first blow fatal. It has been calculated that 80 to 100 tons of poisonous gas would suffice to enclose London, Berlin, or Paris in deadly clouds of gas and destroy them with strategically placed bombs, while the gas prevents the fires from being extinguished. ‘The thought is of course harrowing,” writes Douhet. Especially terrifying is the knowledge every advantage belongs to the one who strikes first. So it will not be possible to wait for opponent to take up these so-called inhuman and illegal weapons first for you to obtain entirely unnecessary) moral right to make use of these weapons yourself. No, necessity will force every nation to use the most effective weapons available, immediately and with the greatest possible ruthlessness. But the word “undefended” remained ambiguous, argued James Witford Garner, when he, an expert in international law, summarized the First World War in International Law and the World War (1920). In air attacks on cities, military damages had been insignificant or nonexistent, while non-combatants had been subjected over and over again to illegal destruction of life and property. Warfare had regularly done what it claimed to avoid while failing to do what it claimed to achieve. “What are the rules for this kind of cricket?” asked the newly appointed chief for India’s Northwest Province, Sir John Maffrey. The air force headquarters for India answered that international law did not apply “against savage tribes who do not conform to codes of civilized warfare.” Warning ought to be given before an attack (so that people could take cover), but on the other hand, the attack should be a surprise (since that would increase the death toll). Loss of life was, after all, what made the greatest impact on morale. Women held little value for the Afghans, reported headquarters, but instead were considered “a piece of property somewhere between a rifle and a cow.” So killing Afghani women could not be justly compared with similar losses among European civilians. In 1922 a RAF memorandum lists a series of available means of terror: timed bombs; phosphorus bombs; “crow’s feet,” which maimed humans and livestock; whistling arrows; crude oil used to pollute drinking water; and “liquid fire,” a forerunner to napalm. ‘There was no sign of discomfort” regarding such methods in war, writes the English historian Charles Townshend. Several days later, the Star’s reporter places these events in a larger context. Now the story is seen as a chapter in the natural extinction of the race: The Hottentot is too devoted to his animals. Every animal he has ever owned is burned into his memory. If his herd is taken from him, he loses his will to live. Of the ten Hottentot tribes, three have already died out. The rest are in the process of disappearing. These days, when societies are formed for all kinds of threatened species, it might be time to form one in defense of the Hottentot, the Star’s reporter concludes. South Africa continued to bomb uprisings in Southwest Africa in 1925, 1930, 1932, and so on up to 1989, when Namibia became independent. For Theodore Savage and his neighbors out in the country, the first bombing raids on London are nothing more than a glowing spectacle against the night sky. But refugees stream in like huge swarms of “human rats.” Driven to desperation by fear and hunger, they flood the countryside. “Women, like men, asserted their beast-right to food—when sticks and knives failed them, asserted it with claws and teeth; inhuman creatures, with distended and wide, yelling mouths, went down with their fingers at each others’ throats, in each others’ flesh . .”94 In Cicely Hamilton’s Theodore Savage (1922, revised 1928) England has been bombed back into the primitive state depicted by Hobbes, Malthus, and their successors. Timid little Theo does not turn into a true wild beast, but he learns to hunt rabbits and root garbage like an abandoned dog, always hungry, always afraid, always on his guard th strangers and neighbors, for everyone is his enemy. When tribes gradually start to take form, it is on the basis of fear, brutality, superstition, and the hatred of strangers. A ‘anatic preaches the new gospel—salvation through ignorance. In the end, the old, helpless Savage is the only survivor of the legendary age before the Catastrophe. For his grandchildren his name becomes a symbol of a dead civilization, so used that no one knows any longer what it was for or how it was lost. Who is it that bombs us back to barbarism? In Anderson Graham’s The Collapse of Homo Sapiens (1923) the answer is very clear. It is Africans and Asians who, for some reason, have been able to achieve the technological expertise that up to this point has esis for the superiority of the West. Before the novel is over, we have learned that universities must take the blame for their criminal foolishness in teaching students of foreign races. “They had even discovered a deadlier gas than ours, and explosives of such power that two or three bombs had been enough to wipe London out of existence.” And now the dark races are using this advantage to level the civilization they hate. The bombers fly so low that you can see the dark skin of the soldiers and their foreign uniforms, you can hear their crude laughter as they drop their little bombs. There is no pretense in Douhet. He knows what it’s all about and he says it openly, shamelessly, almost with pleasure. He was followed by a string of lesser prophets, who tried to give terror a more human face. The good thing bout air warfare is that instead of killing people, we can destroy their economy, writes the British military theorist J.F.C. Fuller in The Reformation of War (1923). In Baghdad in February of 1923, the newly arrived staff officer Lionel Charlton visited the local hospital in Diwaniya. He had expected diarrhea and broken bones, but was instead suddenly and surprisingly confronted with the results of a British air raid. The difference between a police baton and a bomb was brutally obvious. Had it been a question of war or an open rebellion, he as an officer would not have had any complaint, he writes in his memoirs, but this “indiscriminate bombing of a populace … with the liability of killing women and children, was the nearest thing to wanton slaughter.” He became more and more doubtful about the methods with which “an appearance of law and order” was maintained in Iraq. Soon a new sheik had stirred up a rebellion and had to be punished. But from 3,000 feet it was not so easy to target him specifically. When the bombs exploded without warning in the crowded bazaar, innocent and powerless subjects would be killed along with their oppressors. Was it right for an entire city to suffer for one man’s crime? And was he even a criminal himself? Perhaps the informants who had fingered him had personal reasons to go behind his back. To bomb a city on those grounds was a form of tyranny that threatened to make the British even more hated. Charlton’s superior, John Salmond, made no bones in admitting that the bombs struck at the innocent. But the established political line had to be followed. If the air force was to survive as an independent branch of service, it had to prove its efficiency and could not afford sentimentality. As expected, when the rebellious sheik was bombed, more than twenty women and children lost their lives. Charlton no longer wanted any part of it. He requested to be relieved of his post on grounds of conscience. Headquarters sent him back to England, where he was forced to retire in 1928. A reminder to trolls using proxy servers. Please don’t waste your time and mine posting comments here. Proxy servers are verboten. ‘I shouldn’t dream of wasting my time by picking holes in the attitude of the Italian prelates throughout the war for Ethiopia. Thanks to the mustard-gas sprinklers that are used in Australia for destroying rodents, Fascist aviation has been enabled to strip whole populations of hapless negroes of their skin, so that they lay rotting in heaps in front of their huts. It makes no difference to me if the Italian prelates affirm that a war like this seems chivalrous to them. I believe that I know what is chivalrous and what is not.’ Georges Bernanos , A Diary of My Times. This is a principled stance, given how easy it is to believe, as with the death penalty, that there are rare heinous instances where it is justified. Of course, the rare becomes the common. Ellsberg started down the radical road because of the fire bombings and use of nuclear weapons during World War II. He had nightmares about them happening again if the Vietnam War expanded into a superpower conflict. Beyond the killing and maiming of people, aerial bombardment is a way of terrorizing the populace, as the US drone program does. It is a perverse form of social control. People in villages in Pakistan, Afghanistan and Yemen become fearful of being caught out in the open, fearful of being in buildings that could become targets, mistrustful of others that they suspect of being informants. The program destroys the everyday bonds of social life in these places.